Through advancements in ocean going, offshore drilling platforms, combined with extra requirements for safety, most Oil & Gas drilling operations are now classed under intrinsic environments, where access to Intrinsically Safe (I/S) Equipment is mandatory. Furthermore, most I/S zones are now separated by heavy steel doors that create barriers for marine vhf radio and other forms of wireless communications. Deep Earth Systems provides wireless solutions, through Leaky-Feeder cable that allow radio, WiFi & Microwave radio to pass through these barriers whilst maintaining an intrinsically safe zone. Smartcomm, Commscope Radiax & RadiaFlex cable, otherwise known as “Leaky Feeder”, acts as a “leaky” antenna, allowing radio signals to flow from one end to the other, in duplex. For VHF Systems, our best product is PVC VHF Leaky Cable, designed especially for the VHF radio spectrum. Utilizing Becker Varis Head End Equipment, ICOM Repeaters and VHF Leaky Feeder Cable is is an efficient method to transmit Radio Communications throughout your vessel. Approved by FM Labs as Intrinsically safe. 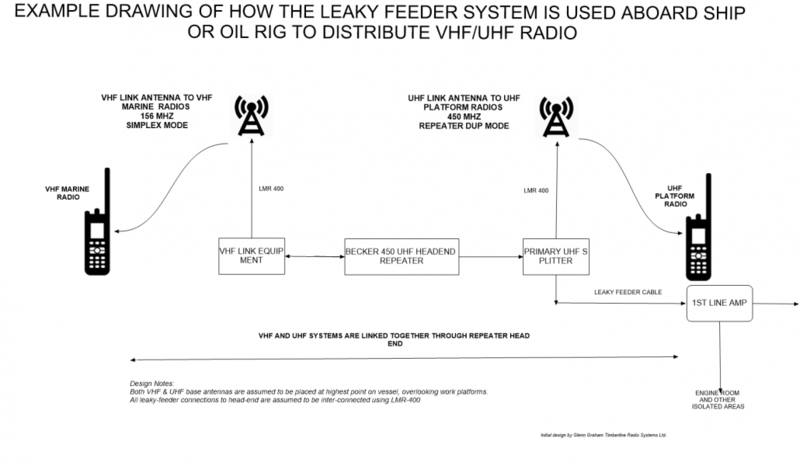 In the example diagram (below) we illustrate how to a typical leaky feeder system would be installed aboard a ship or Oil Rig.